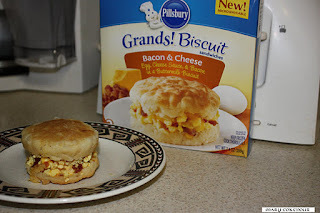 Food Adventures of a Comfort Cook: Pillsbury Grands Breakfast Sandwich Doesn't Satisfy. 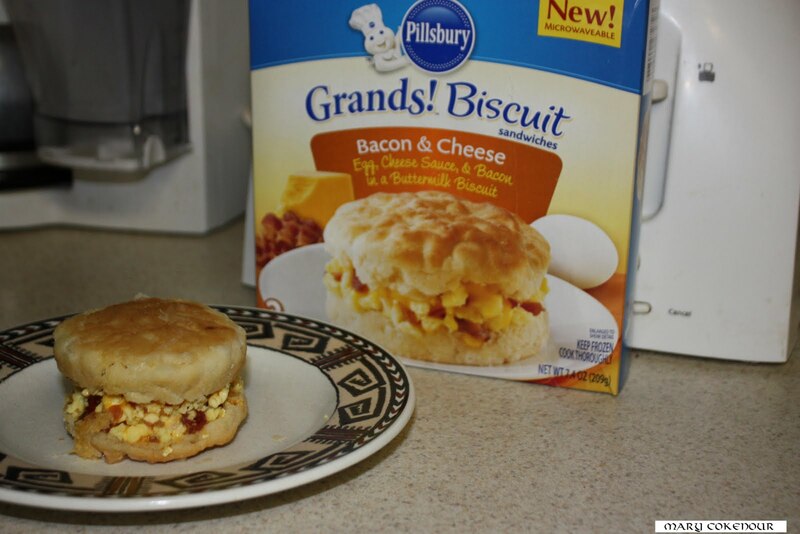 Pillsbury Grands Breakfast Sandwich Doesn't Satisfy. When I saw the television commercial for Pillsbury's new Grands Biscuit microwaveable sandwich, I thought, "great, something I can make quick when I'm in a rush. 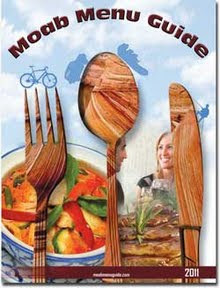 Yes, it's quick to make, but disappointing when it comes to taste and texture. Inside the box are two packages; within each package is an open biscuit with chopped up pieces of scrambled egg and bacon on top of each. There's supposed to be cheese, but it is very hard to see. The instructions on the back of the box state the product should be microwaved while still frozen, and gives heating times dependent on the power of the microwave itself. Test number one: as stated on box, took product out of plastic wrapper, set on microwave safe dish, heated at the appropriate temperature and time. 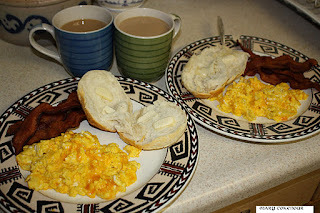 Conclusion: so this is what hockey pucks taste like with eggs, bacon and cheese on them. The biscuits did not fluff up and become flaky as insinuated on the commercial; the eggs and bacon were hard and tasteless, but a good dose of ketchup gave it flavor. However, after the second bite, the rest of the sandwich ended up in the trash. Test number two: let the second package defrost in the refrigerator; followed rest of the instructions but cut the cooking time in half due to its not being frozen any longer. The biscuit was softer, but wet and mushy; however the eggs, bacon and cheese cooked up better; it still needed a good dose of ketchup though. Overall opinion: this product is something I would not purchase or try again; I certainly would not recommend it to anyone. Conclusion: best to give myself extra time in the morning and cook up my own all American breakfast of scrambled eggs, crisp bacon and buttermilk biscuits. For the scrambled eggs, add one tablespoon of half and half for every two eggs, a dash of salt and pepper and some shredded sharp cheddar cheese. Here you go Pillsbury, a breakfast worth all the time and work to prepare it. As to something quick when I'm in a rush, still working on that one.